A buffer stock scheme is a government plan to stabilise prices in volatile markets. This requires intervention buying and selling. Supply can vary due to the weather. See: Why are prices of agricultural goods volatile? Prevent farmers/producers going out of business because of a drop in prices. If there is a very good harvest and supply increases to S2,the market price would fall to P2. To maintain the price at TP, the government will need to buy the surplus stocks (Q2-Q1) and store the goods. This reduces supply on the market and effectively keeps prices at the target price. 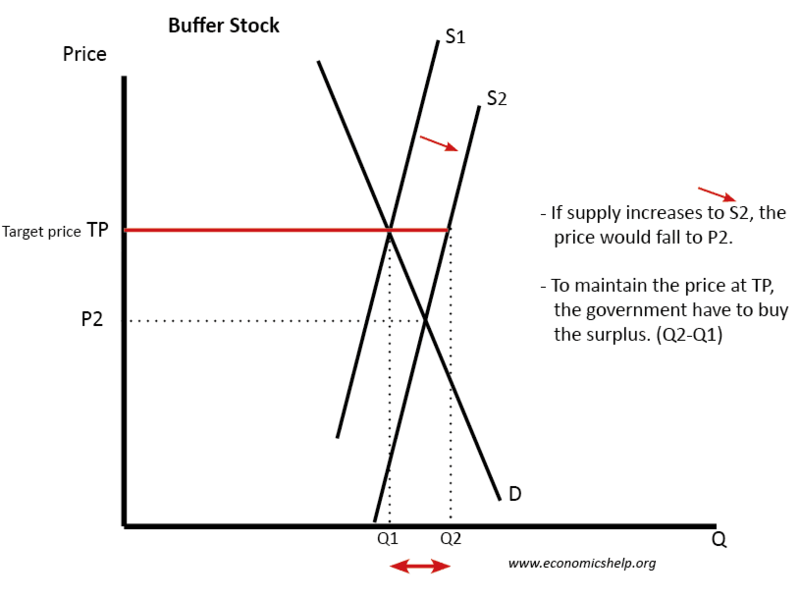 To reduce prices back down to target price, the government need to sell goods from the buffer stock and effectively increase supply back to S1. Stable prices help maintain farmers incomes. A rapid drop in prices can make farmers go out of business, which leads to structural unemployment. Price stability encourages more investment in agriculture. Farming can have positive externalities e.g. helps rural communities. A drop in price could cause a negative multiplier effect within rural areas. Target prices help prevent excess prices for consumers and help reduce food inflation. This might be important for households living in poverty, who may struggle to pay high prices during years of shortage. It helps to maintain food supplies and avoid shortages. It is possible the government could make a profit from a buffer stock scheme. If it buys during a glut and sells during a shortage, it can make a profit. Cost of buying excess supply could become quite high for the government and may require higher taxes. Minimum prices and buffer stocks could encourage oversupply as farmers know any surplus will be bought. It could even encourage excess use of chemicals to maximise yields because farmers know any excess supply can be sold – even if the market doesn’t want it. Government subsidy to farmers may encourage inefficiency amongst farmers. There may be less incentive to cut costs and respond to market pressures. Some goods cannot be stored in buffer stocks, e.g. fresh milk, meat e.t.c. Government agencies may have poor information e.g. what price to set, how much to buy? is there really a surplus? In practice, it can be difficult to know whether there is a surplus until later in the year. Administration costs of the scheme. Minimum prices for foodstuffs may require tariffs on imports. Globalised markets. Agriculture is a globalised market. 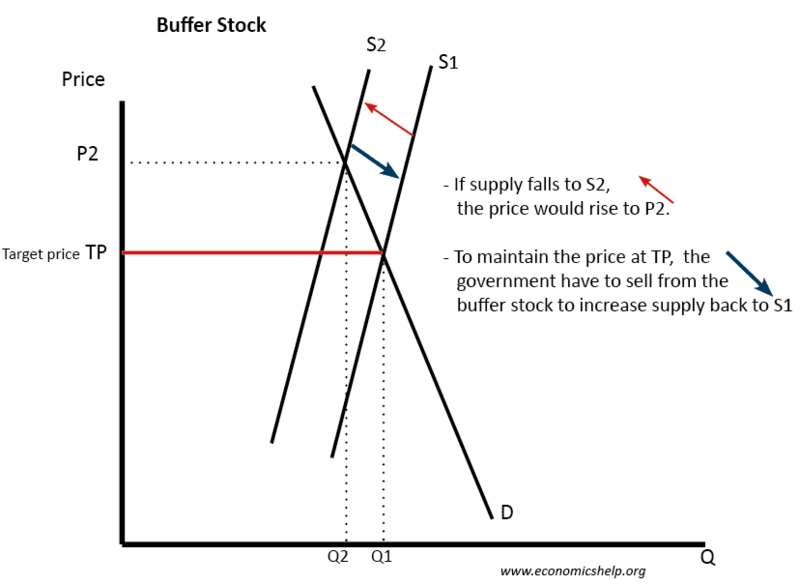 If some countries form a buffer stock scheme and buy excess supply, they may find that other countries ‘free-ride’ on their efforts to keep prices high and undercut them. Genesis Wheat stores. In Genesis, Joseph stored wheat during the seven years of feast, so during the seven years of famine, he was able to distribute wheat from the stores. Established in the first century BC in China. The aim was to stabilise supply, buying grain in good years and distributing to regions suffering shortages. The idea was revived by Henry A. Wallace (a future adviser to Pres. Roosevelt) He took the idea from Chinese history and gave it this term. In 1929, the US implemented forms of agricultural intervention. From these 1930s schemes, government support for agriculture has grown and proven difficult to take away. The scheme was largely a failure because it became very expensive to keep buying the surplus. There was never any real shortage. In the end, the EU had to start implementing quotas to limit excess supply. CAP was slowly reformed to reduce the target minimum prices. This aimed to stabilise the price of wool. The advantage is that wool is easy to store. In years of high supply, the government would buy and store the excess wool. In times of shortage, the government would release wool from the stores. The scheme was abandoned as it primarily became about the government buying wool. There was a period of declining demand, and the scheme merely encouraged farmers to keep producing wool – rather than respond to changing market signals. In 2017, the Ivory Coast and Ghana planned to revive a buffer stock scheme for cocoa. The Ivory Coast and Ghana control over 60% of the world’s supply. In 2017, they face the prospect of a global surplus of 371,000 tonnes – which will lead to plummeting prices and less export revenue.